Our Waves of Change model, based on long term historical data, shows that the chaos we’re experiencing is normal and occurs at the boundary between stages of social and technological development, just before we collectively invent a new trajectory to the future. When we apply what we know about complex adaptive systems to our organizations, markets, political systems and the way we interact with each other, we are able to successfully navigate complexity, uncertainty and accelerating change. During the 20th Century (and the start of the 21st) our world has been shaken by three massive waves of social and technological change, the tail end of the Industrial Age (1700-1950), the entire Information Age (1950-2000) and most of the Knowledge Age, (2000-2010). 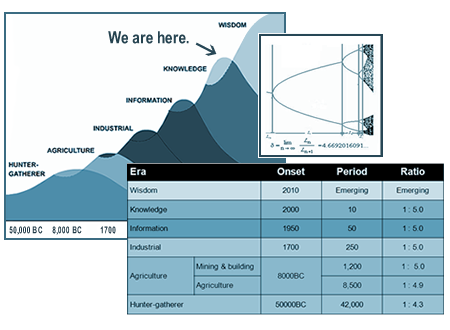 The new era that’s just starting to emerge, the Wisdom Age – and its business equivalent, the Wisdom Economy – are characterized by “the wise application of knowledge”. This is the next step up in what computer programmers know as the data hierarchy: activity, data, information, knowledge and wisdom. The waves of change follow a predictive pattern exhibited by complex adaptive systems, a period doubling cascade, where each wave is one-fifth shorter than the one before. The complexity model explains why Industrial Age linear methods no longer work as well as we would like, and why markets, economies and political systems are in turmoil. We use the model to forecast new waves of social and technological transformation and to help organizations design better products, services, processes, structures and methods to fit with the new trends that are emerging. The model helps us understand how to work across the boundary between two worlds, the effective methods from yesterday, and the new methods for tomorrow. It gives us a framework for discovering or designing the simple rules of interaction and the global meta-rules that will allow us to achieve our goals.